I am horrible about blogging when I have something on my mind that I can't blog about. If I've decided not to write about something, even if it's only for a couple of days, when I sit down to write, that topic becomes the only thing that I can possibly think of blogging about, even though I had a number of different ideas bouncing around in my head until the-topic-which-I-can't-mention came up and apparently chased all other ideas out of my mind. So it's unlikely I'll be posting anything ground breaking in the next few days, until I can put together a post about the loudly shouting idea that's ricocheting around inside my skull. Hopefully that will be before I go completely crazy with writer's block. I don't think the pregnancy hormones help with my obsessiveness. In fact... the writer's block apparently extended into sewer's block because I couldn't even focus enough to sew anything last night... or paint... which is, in my mind at least, shocking. When I finally blog about it you'll see why. I kind of feel like I'm inside of a snow globe that's being shaken violently. Sure when the globe gets put back onto the table everything is beautiful, but the shaking up part has got to be a little bit stressful for those little plaster people inside the cute plaster house. 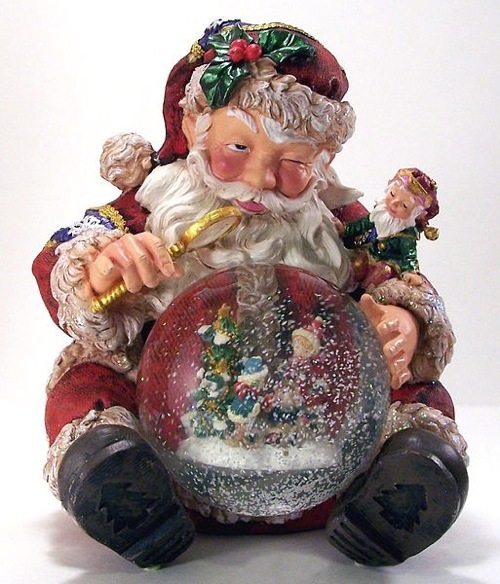 (image from wikipedia's snow globe page). Why don't you just tell us what's on your mind, dear? Now we're burning with anticipation and apprehension! I very much sympathize with you're post. I have this happen to me over and over again. Sometimes they come in clusters and other times they wait for months. Like you, I find that it's almost impossible to work on something creative. My outlet that lets me refocus seems to be manual labor like gardening or cleaning. I find myself arguing everything out as I try to compose my thoughts. I have a lot of epiphanies that way. Especially with the down and dirty task of pulling weeds or shoveling dirt. I look forward to reading your post when you can talk about it. I'm right there with you. I feel like the blogging I've done this week has nothing to to with what I have going on in my head. I want to blog about it but I really can't at the moment.